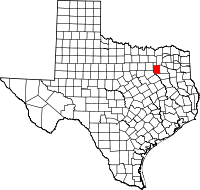 Kaufman County is a county in the U.S. state of Texas. As of the 2010 census, its population was 103,350. Its county seat is Kaufman. Both the county, established in 1848, and the city were named for David S. Kaufman, a diplomat and U.S. Representative from Texas. Kaufman County is part of the Dallas-Fort Worth-Arlington, Texas Metropolitan Statistical Area. Western artist Frank Reaugh moved from Illinois to Kaufman County in 1876 to draw inspiration for his paintings such as The Approaching Herd (1902). According to the U.S. Census Bureau, the county has a total area of 808 square miles (2,090 km2), of which 781 square miles (2,020 km2) is land and 27 square miles (70 km2) (3.3%) is water. Located in the northeast portion of Texas, it is bounded on the southwest by Trinity River, and drained by the east fork of that stream. As of the census of 2000, there were 71,313 people, 24,367 households, and 19,225 families residing in the county. The population density was 91/sq mi (35/km²). There were 26,133 housing units at an average density of 33/sq mi (13/km²). The racial makeup of the county was 81.10% White, 10.53% Black or African American, 0.61% Native American, 0.47% Asian, 0.02% Pacific Islander, 5.66% from other races, and 1.61% from two or more races. 11.11% of the population were Hispanic or Latino of any race. There were 24,367 households out of which 39.50% had children under the age of 18 living with them, 63.10% were married couples living together, 11.30% had a female householder with no husband present, and 21.10% were non-families. 17.80% of all households were made up of individuals and 7.50% had someone living alone who was 65 years of age or older. The average household size was 2.87 and the average family size was 3.24. In the county, the population was spread out with 29.20% under the age of 18, 8.20% from 18 to 24, 29.50% from 25 to 44, 22.40% from 45 to 64, and 10.60% who were 65 years of age or older. The median age was 35 years. For every 100 females, there were 97.40 males. For every 100 females age 18 and over, there were 94.00 males. The median income for a household in the county was $44,783, and the median income for a family was $50,354. Males had a median income of $35,537 versus $26,494 for females. The per capita income for the county was $18,827. About 7.80% of families and 10.50% of the population were below the poverty line, including 13.30% of those under age 18 and 11.80% of those age 65 or over. Kaufman County is part of the Dallas/Fort Worth DMA. Local media outlets include: KDFW-TV, KXAS-TV, WFAA-TV, KTVT-TV, KERA-TV, KTXA-TV, KDFI-TV, KDAF-TV, KFWD-TV, and KDTX-TV. Other nearby stations that provide coverage for Kaufman County come from the Tyler/Longview/Jacksonville market and they include: KLTV, KYTX-TV, KFXK-TV, and KETK-TV. Kaufman County is served by three newspapers, the Terrell Tribune, the Kaufman Herald, and the Forney Messenger. Forney, Texas, is also served by online news media outlet inForney.com who covers breaking news for the county. A quarterly magazine called Kaufman County Life is produced by the Terrell Tribune. The Kemp and Mabank areas are included in coverage by The Monitor and Athens Daily Review newspapers. Prior to 1952, Kaufman County was a Democratic Party stronghold in presidential elections. From 1952 to 1980, it was still primarily Democratic, though the party's margin of victories were far lower than before, & Republican Richard Nixon won the county handily in 1972 as part of his national landslide. Starting with the 1984 election, it has become a Republican stronghold like most white-majority counties in the South, though neither of Bill Clinton's 2 Republican opponents managed a majority despite winning the county due to Ross Perot's strong third-party candidacy. Ripley, George; Dana, Charles A., eds. (1879). "Kaufman" . The American Cyclopædia. ^ "Breaking news: Kaufman County District Attorney Mike McLelland, wife reportedly found dead in home". The Dallas Morning News. 30 March 2013. Retrieved 31 March 2013. ^ "Breaking news: Texas County District Attorney and Wife Found Dead". The New York Times. 30 March 2013. Retrieved 30 March 2013. ^ Eiserer, Tanya and Jana J. Pruet (April 13, 2013). "Ex-justice of peace is prime suspect in Kaufman DA slayings". Dallas Morning News. Retrieved April 17, 2013. ^ Eiserer, Tanya (April 17, 2013). "Wife of jailed ex-Kaufman County justice of the peace is now behind bars, charged with capital murder". Dallas Morning News. Archived from the original on April 18, 2013. Retrieved April 17, 2013.